ab81887 is specific for Calcitonin Gene Related Peptide. It also recognizes rat beta CGRP and human alpha CGRP (10 fold less sensitivity compared to rat alpha CGRP). Dorsal root ganglia, pancreas and gut. 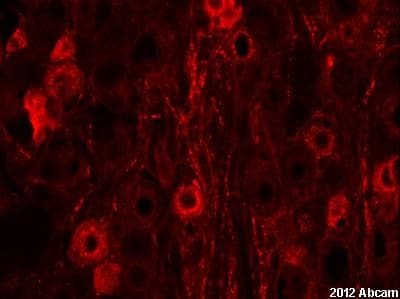 This antibody is an excellent tool for immunohistochemistry and for multiple labeling immunofluorescence of peripheral tissue like stomach, intestine, pancreas, sensory ganglia, and all the regions of the body that are innervated by primary afferent neurons as well as central nervous tissue. Our Abpromise guarantee covers the use of ab81887 in the following tested applications. Neutralising Use at an assay dependent concentration. 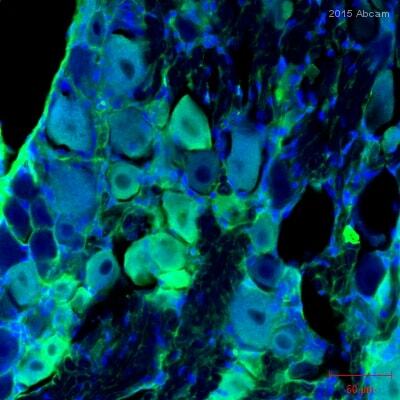 ab81887 staining rat DRG sections by IHC-Fr. The sections were fixed with 4% paraformaldehyde, permeabilised in 0.3% PBS-Tween and blocked for non-specific protein-protein interactions with 10% donkey's serum for 1h at 24°C. 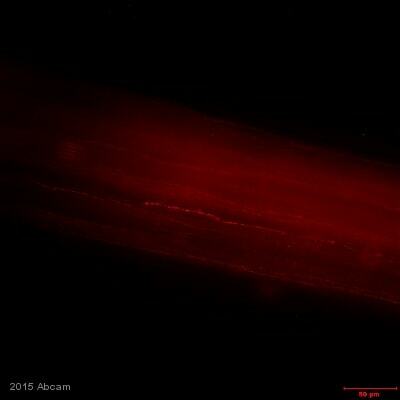 Staining with ab81887 at a 1/1000 dilution in PBS-Triton (0.3%) with 10% donkey's serum and 0.02% azide was performed for 24h at 4°C. 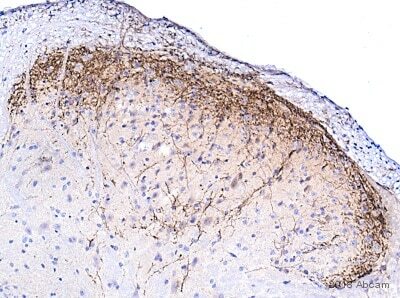 A donkey anti-mouse Alexa568 polyclonal antibody at 1/1000 was used as the secondary antibody. 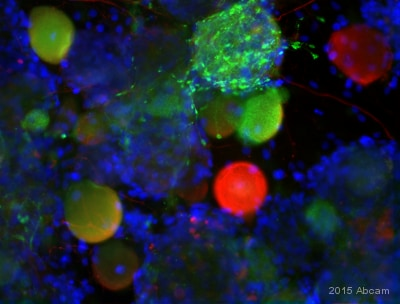 Immunofluorescent staining of CGRP (red) in cryopreserved DRG neurons grown on coverslips using ab81887 at 1/50 dilution. Green staining is PGP9.5. 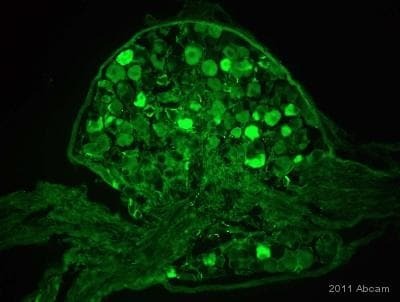 Yellow staining is the colocalization of CGRP and PGP9.5. 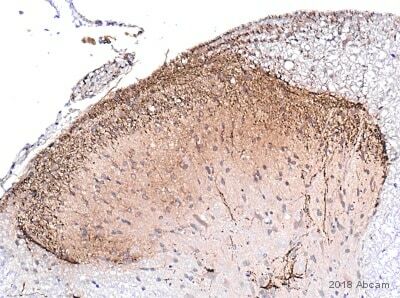 ab81887 staining CGRP in Mouse dorsal root ganglion tissue sections by Immunohistochemistry (IHC-Fr - frozen sections). Tissue was fixed with paraformaldehyde and blocked with 2% BSA and 2% goat serum for 30 minutes at room temperature. Samples were incubated with primary antibody (1/300 in blocking solution) for 12 hours at 4°C. An undiluted Alexa Fluor®488-conjugated Goat anti-mouse IgG polyclonal (2 mg/ml) was used as the secondary antibody. Publishing research using ab81887? Please let us know so that we can cite the reference in this datasheet.